We are often asked about the relevance of scale division size to scale capacity so here is a brief explanation. When you read on a the display of a set of scales something like 'Capacity = 15kg' or 'max = 30kg' , it means just that. It is the maximum amount of weight that the scale can display. Also it is not wise to exceed this limit. Most scales will have some sort of overload protection but certainly not all of them, and you wouldn't want to trash your expensive balance just because you placed too much weight onto it! The division size is the increment that scale counts up in. If you think of an old dial set of scales or bathroom scales, then it is the smallest marker. Whereas on a set of analogue scales you can read between the markers, on digital scales you cannot. The scale will choose the nearest available division, either up or down. So it is imortant to choose the appropriate division size for the product you are weighing. e.g. You own a sweet shop and the confectionery scales you are using have a division size of 10g. A customer asks for 100g of small sweets (that actually weigh 1g). You weight out the sweets on the scales but you could easily add more than 100g 5 or 6 sweets more but the scales would still read 100g. After many weighings you can see that it becomes costly, especially if the product is something like caviar or smoked salmon! Division size is often shown after the capacity, preceded by 'x' (meaning by). Such as 15kg x 5g. This is the minimum weight that should be placed on the scales before any readings become significant. It is usually 20 divisions for trade scales (see below) and can be different for non-trade scales. On a 15kg x 5g scale the minimum would usually be 100g (20 divisions). It is not recommended though to buy a set of scales to weigh products less than the quoted minimum. e.g You wouldn't weigh 5 grams of gold on a 15kg x 5g set of scales. 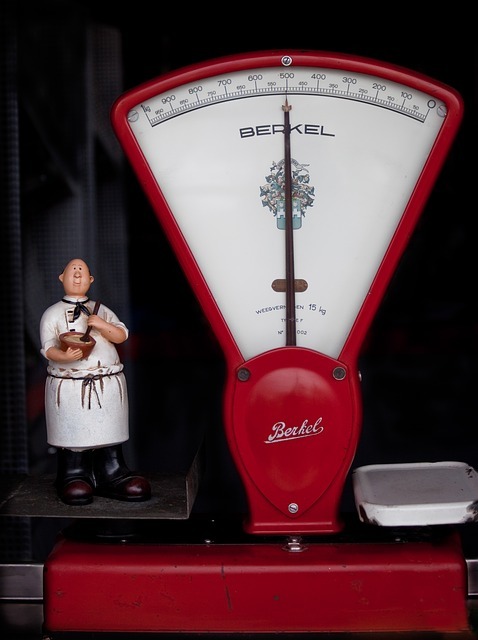 Legal for trade scales are scales that have been 'verified' for trade typically by a Trading Standards Inspector, where traceable weights are placed on the scales and the scales must weigh within certain tolerances. If the scales are outside these tolerances they cannot be used for trade. Not all weighing scales though are 'verifiable', they must first have obtained a type approval through a governing body (which can vary from country to country). Usually scales that can be verified display a green 'M' sticker. Legal for Trade Scales often have a smaller amount of divisions than 'non-trade' scales. For instance a typical shop set of scales will have 3000 divisions (15kg x 5g) whereas a scale used internally in industry may have 30000 divisions (30kg x 1g). But there is only one of them you can sell a pork chop on! As a rule of thumb you would normally purchase Legal for Trade Scales if you are selling a product by weight. (As opposed to checkweighing or creating a recipe). This is the smallest scale interval that can be used to determine price based on weight in commercial weighing for a particular scale. The value of the verification scale interval (e) is determined by the scale manufacturer. Sometimes, a scale will have a verification scale interval that is different than the normal or actual scale interval. For instance, the scale could be capable of displaying in increments of 0.01g, but its verification scale interval is specified as 0.1g. In this situation, you could only charge a customer based on 0.1g increments although the scale has the ability to display 0.01g increments. This was just a fairly brief (believe it or not) outline of scale terminology. If you have any questions or comments please do not hesitate to contact us at Weigh-Till.